We offer everything from residential and day services to home respite, community habilitation and brokers to help you create a completely personalized plan. We’re looking forward to partnering with you. The Heritage Christian Services Foundation exists to ensure people with intellectual and developmental disabilities have the best care and the best quality of life regardless of how the economy is doing. With dozens of homes and programs in the Greater Rochester and Buffalo, NY areas, there is opportunity for everyone to get involved with Heritage Christian Services. One thing you’ll notice in December is how much we love Christmas. 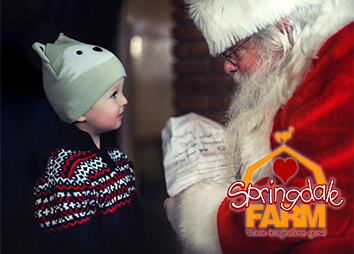 In addition to school tours and other seasonal events, we host Christmas With Santa across three Saturday mornings: Nov. 24, Dec. 1 and 8. Once there, families are served a pancake and sausage breakfast. Coffee, juice and milk are also brought to the table. After dining, families visit with Santa and Mrs. Claus before heading downstairs to our children’s crafts area. And don’t forget to wish our barnyard friends a Merry Christmas! Groups can walk from the Visitors Center to the stables or we’ll drive you over. Breakfast seatings last one hour but you can enjoy the grounds all day if you like! Join us: 9, 10,11 a.m. or noon. This event is made possible thanks to more than 100 volunteers and donations of supplies. Proceeds keep Springdale Farm running and help with animal veterinary care. Thank you for your support. Merry Christmas! Are you or a loved one seeking support? Call our office and ask for the resource advisor. Our staff can answer questions and suggest services that make sense for you or loved ones. Call (585) 340-2000 or (716) 743-2020. Heritage Christian Services, Inc. is an equal opportunity program provider and employer, and complies with Title VI of the Civil Rights Act of 1964 (“Title VI”) and the Americans with Disabilities Act (ADA). Learn more about Title VI here. Our child care division offers three locations in Rochester that provide a unique family environment and creative curriculum to children through age 12. Our health and wellness center in Henrietta is open to the community and provides a wide array of services all in one place, like therapies, classes, conferences and clubs. The farm is an agricultural education center in Ogden that hosts events, field trips, summer camps and private rental opportunities. It’s also a day program site for adults with disabilities.